Debate: Should Air Conditioning Become Uncool? The facts and predictions about the environmental impacts of air conditioning are shocking. First of all, about 500 million metric tonnes of carbon dioxide per year result from air conditioning of buildings and cars. Even if you think that scientist and author Stan Cox’s estimates on future air conditioning use could be a little alarmist, there is no doubt that the number of air conditioners across the planet will increase as wealth grows and as people’s willingness to pay for convenience and comfort increases. More people moving to cities globally means more people living and/or working in stuffy interior spaces all day under the shade of concrete, instead of more traditional wooden houses or even trees. Bear in mind also that the difference in the Global South, as opposed to most developed countries, is that the “need” for cooling can be an economically and environmentally costly 12-months-a-year pursuit. Just as refrigerators and washing machines have been, and continue to be, a mark of entrance to the global middle classes, so have air conditioners become a status symbol that signify that families, businesses and even government and non-government organizations have “made it”. People often make sure to point out that “air conditioning is included”, whether it’s when selling a car, staying in a hotel or welcoming a guest to a home. Those of us working in industrializing countries will be familiar with the normalization of air conditioning and the strange phenomenon, particularly in the tropics, of people said to be “used to the heat”, now enjoying frigid 16-degree temperatures all day long. And there are other costs that are coming to light including increases in respiratory diseases among people who use air conditioning, whether in the United Arab Emirates or in your country. Have you noticed a link between your health and the amount of time you spend in front of an air conditioner? 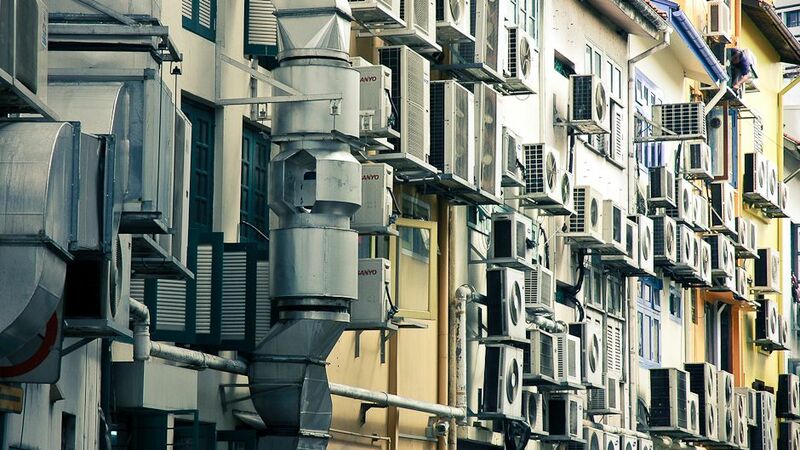 The theme of air conditioning having moved from a luxury good to a status quo “necessity” was picked up recently by the Sydney Morning Herald. It reported that Australia, with a population of 22 million, has installed 1.7 million air conditioners in the past five years alone. These and other examples of staggering growth are occurring in an era when we really should be reducing, not increasing our energy consumption, particularly in areas of our lives where it is easiest to do so (some use the expression “picking the low hanging fruit”) such as using more energy efficient lightbulbs. “It’s surprising how little the air conditioner boom has been questioned, considering its economic, environmental and social costs”, commented opinion writer Matt Wade. Wade’s statement seems reasonable. But is he right? Have you questioned the rise of air conditioning in your life? Is it a need or just something some generations have become accustomed to? In this Debate 2.0, we ask whether we can realistically continue to be fans of air conditioning, especially in light of the climate challenge that is affecting us all? Or should we be re-conditioned to using simple fans for instance, which are dramatically more energy efficient? Debate 2.0: Should air conditioning become uncool? by Mark Notaras is licensed under a Creative Commons Attribution-NoDerivs 3.0 Unported License. What’s the Electricity Forecast for Tokyo Today? Japan encourages its people to use their AC to settings no lower than 28º C in summer, and no higher than 20º C in winter. There are ads on TV promoting people to be “eco” like this. In Singapore the situation is as bad as it can get. Most of the time people are forced to wear winter clothes when working, even though the country lies virtually on the equator. The reason is that most offices, malls, schools, and all forms of other public indoor spaces set the aircon to the lowest possible setting, which is often 16 degrees. This is not only unhealthy, but also very costly for the operators and the planet. Moreover, even when the temperature is higher the airflow is set to maximum creating a constant wind-chill factor in indoor spaces, thus still cooling everyone below a healthy temperature. That is very true. It is called CoolBiz and WarmBiz. We follow this approach here at the UN University in Tokyo and not only is it good for the environment, but it has also saved a lot of money. However, I do not think that this idea has caught on in many other countries and often when overseas I find air conditioned offices and other spaces far too cold. I wonder why more attention is not paid to this problem. Is it just habit, laziness or lack of awareness? Or is it something else, like air conditioning is a luxury that we have earned and so we will use as we like? As others below have pointed out, it is really ironic that commercial and government buildings too often set their air conditioning so cold that one has to wear a sweater during the hot summer. Rectifying this alone would undoubtedly make a huge difference. I applaud Japan’s CoolBiz and WarmBiz initiatives and hope the idea spreads across the planet. I recall spending a summer in India years ago and telling people I’d pray to the fan god at night so that the ceiling fan above my bed wouldn’t stop due to a power shortage. It certainly wasn’t comfortable going without air conditioning back then, but then, AC wasn’t an option. And people got along, just as they had for eons beforehand. I figured I’d better get used to it, which I gradually did. Air conditioning is so much like all of the other conveniences we’ve gotten so accustomed to having…we forget that just a few years ago we didn’t have them. In that way, we’re all spoiled and feeling entitled. This underlying dynamic of creeping escalation of comfort/convenience/ubiquity/entitlement seems to feed directly into the inertia that is ratcheting up our unsustainable impact on this planet, working hand in hand with our population growth to take us to the edge. Japan instituted the WarmBiz and CoolBiz projects under duress, and that pressure of facing a hard stop is perhaps the only thing that will compel people to give up their creature comforts. Otherwise, it is too easy to make excuses and continue the status quo. 1 – Air conditioners also contribute to the urban heat island effect so while it is colder inside, it’s actually hotter outside. Next time you walk past an AC external unit in summer you’ll feel what I mean. 2 – Solutions are possible. But this requires better, more thoughtful design that often uses local, more sustainable materials to manage sunlight, wind and natural tree cover, as opposed to just plonking down another square concrete structure. But design solutions may not be cheaper and could require spending a little more in the short term, for environmental and health payoffs in the long term. Could this be in contradiction with our dominant modes of thinking? How would you tell somebody that in Winter (Japanese or Middle European) you are supposed to wear warm cloth even it might not look according to the fashion and you can’t show your legs, shoulders or other body parts for a while. How do you convey that sweating is healthy in summer and you need to adjust to the environment and do not adjust the environment around you. Two Japanese summers without an aircon didn’t harm at all. I learned how to live with it. This summer a bad cough got me when using aircon. I had to turn it off. We might listen to the body and not to the commercials. The AC provides climate control indoor and emits CO2 and lukewarm air outdoor. I am a big fan of the idea to recycle these negative side effects of the AC, namely, utilizing the waste heat to create something more beneficial by managing and relocating the outdoor facilities. It is a same idea as the waste disposal center utilize waste heat to provide electricity and heat to the gym and indoor pool facility next door. Managing the gym and indoor pool and other facilities even including hospitals through recycling waste heat looks cool and economically sound. This idea can also apply to computer generating heat. Google once tried to relocate their massive computer under the seabed to control the waste heat but failed due to complexity and difficulties in maintenance. Why don’t they use the computer generating waste heat to animate some indoor pool facilities or employ’s shower facilities. I speculate there are some ways to utilize AC waste heat too. Three disconnected thoughts (sent here via the API course). Here in Honolulu, Hawaii, many state office buildings that are so freezing that some workers (including student helpers at the university library) use space heaters. This is particularly outrageous because older buildings that were constructed to catch the tradewinds can stay quite comfortable as long you keep the windows open, but the newer buildings rely on central air conditioning where you can’t adjust the temperature or even open the windows. Yes – Air Con is very uncool. Go without. I do and have never even contemplated fitting it to my home in Australia. I think the airconditioning is a more comfortable and useful for use in some sweltering climates but is also true that some people are addicted to comfort. Large and small comforts are hard to control and there is so strong that concienticen campaigns on this specific topic ..
have the option of using the air conditioning. Now, people feel it is a necessity of life. But as said, there is a cost.